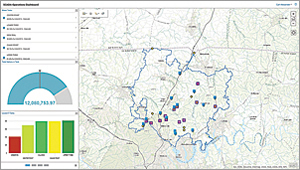 In 2013, the largest water and wastewater utility in Tennessee began transforming itself into a true GIS-centric organization. White House Utility District (WHUD) is geographically Tennessee's largest water and wastewater utility. WHUD's service area extends 600 square miles and serves a population of just over 94,000. On this dashboard, red indicates excessive leakage requiring field response. "We had reached a point where continuing to develop custom software interfaces between software applications became too restrictive," said Bill Thompson, WHUD general manager. Historically, WHUD has used GIS for managing asset information, workflows, subdivision records, and customer service and activities such as performing trend detection analysis, rate modeling, and gross revenue projection; and tracking growth areas, water use, and lots that have sold and those that are available. In 2005, WHUD implemented an extensive leak detection program that focused on the reduction of nonrevenue water [i.e., water lost in the distribution process that was not billable]. WHUD's large coverage area posed a number of unique challenges for the district. The number one challenge was getting accurate information that could be analyzed quickly. In the initial stages of the program, the district was very successful. It reduced water loss from leaks by 50 percent, but WHUD reached a point at which results plateaued. Primarily, this occurred because the technology in use was unable to receive real-time information that could be integrated with other field asset information. The only way WHUD could move forward with the program was to overcome this problem, so it reached out to Esri. 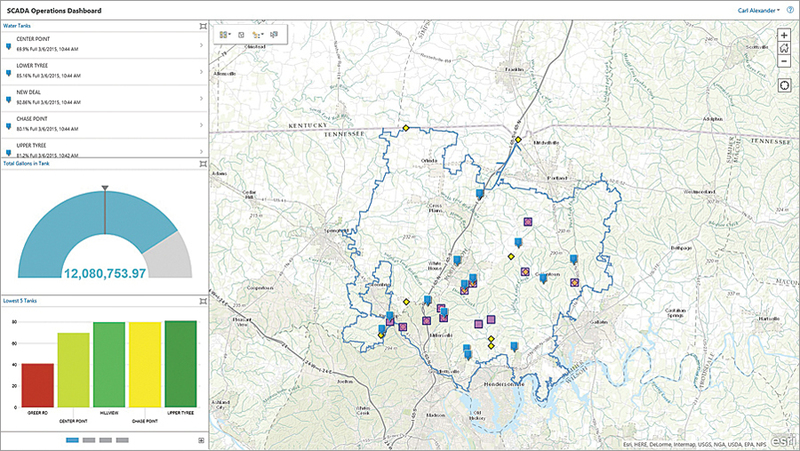 By working closely with Esri, WHUD was able to configure a connection that feeds real-time information from the district's smart meters into ArcGIS. Esri also helped to configure the district's supervisory control and data acquisition (SCADA) system so that flow meters, tanks, and pump stations all display real-time data. This information is accessible via ArcGIS for Server and ArcGIS Online as a web app and dashboard. The web app uses color coding to show how the actual flow for a district metered area (DMA) compares to what has been determined by the staff as an acceptable flow rate for a particular zone. Using a set of geoprocessing tools and models, WHUD office staff can find where water loss appears excessive and then isolate potential leaks down to subzones, individual valves, and specific pipe segments. 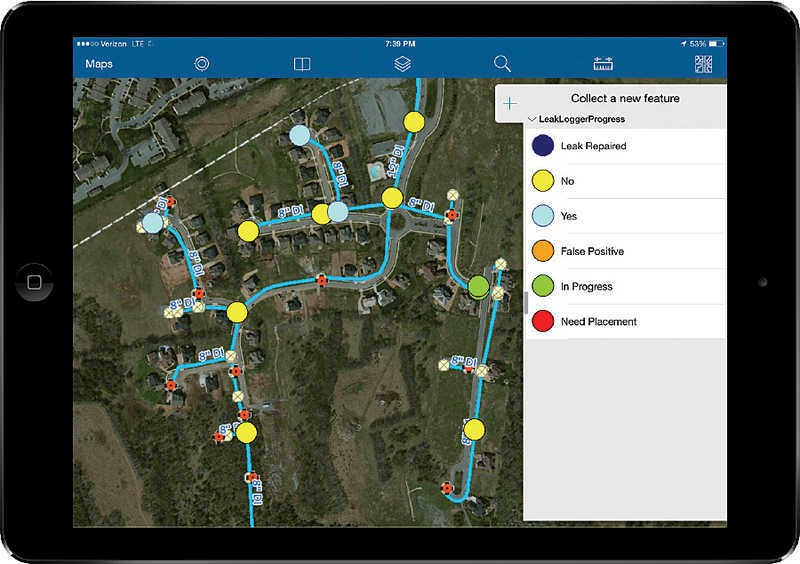 Water Leak Investigator, a solution that is a configuration of the Collector for ArcGIS app, lets field crews pull up detailed information on a specific leak that includes a projection of the number of gallons that is excessive for an area. Once a leaking area is identified, office staff create point features to let field staff know where to place the leak loggers and share that information using ArcGIS Online. Field staff place loggers and leave them in place overnight. The next day, more staff go out and read the data from the loggers. The data is then input on the logger point feature so office staff can see if a leak has been identified. "If we have found the leak, a work order is created to fix it," Thompson said. "If not, we continue the process in that area until the leak is found. Once the leak is found and fixed, the new flow data for this DMA zone is updated and the zone will change colors to reflect the repair." All of the district's flow meters are set up with high- and low-flow alarms. Anytime a meter's readings go above or below the gallons-per-minute (GPM) thresholds, an alarm is sent. ArcGIS GeoEvent Extension for ArcGIS for Server receives that alarm and creates a GIS feature that notifies WHUD's personnel. Staff can access the alarm's location on any device through the point feature GeoEvent Extension creates. Staff members can assess the situation in real time and compare it with historic data to determine if they need to dispatch a crew. For instance, after receiving a GeoEvent alert about a low-pressure tank, they can then compare that reading with historic pressure readings recorded for the tank and consult service data, such as customer call-ins related to low pressure, before making a decision. Water Leak Investigator, a solution that is a configuration of the Collector for ArcGIS app, lets field crews pull up detailed information on a specific leak. Previously, it could take months to narrow down an underground leak to a specific location. Now leaks are detected and repaired within two to three weeks. The district will be able to cut repair times to 72 hours by July 1, 2015, and all field staff will have access to mobile GIS. "The key benefit to ArcGIS in the field is the fact that it can be viewed in real time," Thompson said. "This information allows us to be proactive rather than reactive." The monetary savings that can be realistically achieved will likely exceed $1 million annually according to Pat Harrell, WHUD district engineer. Beyond these direct monetary savings, there are less easily identified indirect savings. These indirect savings include recovered capacity for treatment plants and recovered distribution capacity in transmission lines. Rapid detection and repair of leaks also generate cost savings because less electricity is used, and there is less wear and tear on equipment. In addition, because the system is more efficient and proactive, there is less need for employees to work overtime. Those benefits have a direct effect on WHUD's customers because they affect both short- and long-term water rates. WHUD expects initial savings to offset the cost of installing smart meters and the information technology infrastructure. Other utilities in the region have made site visits to learn how WHUD is using technology to effectively detect leakage that is not coming to the surface. "With ArcGIS Online, it's not as daunting as half the people think it is," Alexander said. "Using out-of-the-box COTS solutions like Collector has made it simple to get the tools deployed into the hands of our team quickly." According to Harrell, "So much data is coming in the system at this point that the district has been caught a little off guard by the speed and quality of the information collected." So far, WHUD has improved planning, decision making, and customer service with the leak detection system. "The best part is that you don't have to be an engineer to make use of the GIS," Harrell said. Customer service representatives now access the web map when customers call in. They can see right away if there are pressure issues and are able to confidently explain the situation. They are even using ArcGIS Pro to see 3D data visualizations that illustrate the effect of elevation in tank and pump station pressure to provide more accurate interpretations. With just a few minutes of analysis, staff can determine if low- to no-pressure conditions or other issues exist and use their findings to troubleshoot customer questions or work with developers on pressure issues. After WHUD completes the smart meter installation, it will continue developing additional real-time data integration with its GIS. The information will display on simple, accessible viewers that tap into critical big data feeds. "When we decided to move to a true GIS-centric environment, we felt like it was critical to examine every aspect of our organization from top to bottom," Thompson said. "In so doing, one of the things that I personally felt strongly about was the role GIS should play in the organization. I felt GIS should not report to the engineering department but should work collaboratively with them. I also felt equally as strong that IT should report to GIS instead of GIS reporting to IT. If we are to achieve our goal of having a true GIS-centric environment, GIS must be moved from an afterthought in the organization to a leadership role where our actions support our commitment."